Stockton & Copperopolis combine Number 16 photographed just outside Copperopolis. Due to rising lease costs, the S&C management decided to purchase its own combine for trains running on the Milton branch. It is very similar to those used successfully on the Virginia & Truckee Railroad and is expected to give good service here. 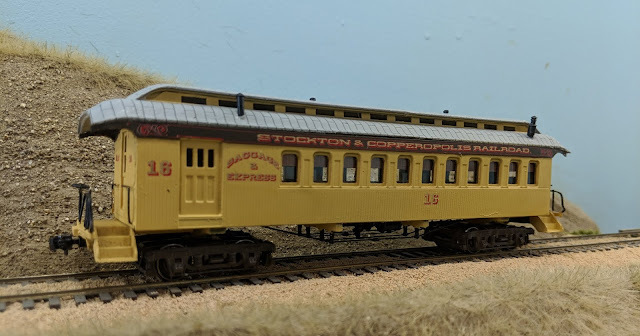 In reality, for several years now I have not had S&C lettered coaches for the Milton branch and have been using some of my old Moraga Springs Northern equipment. 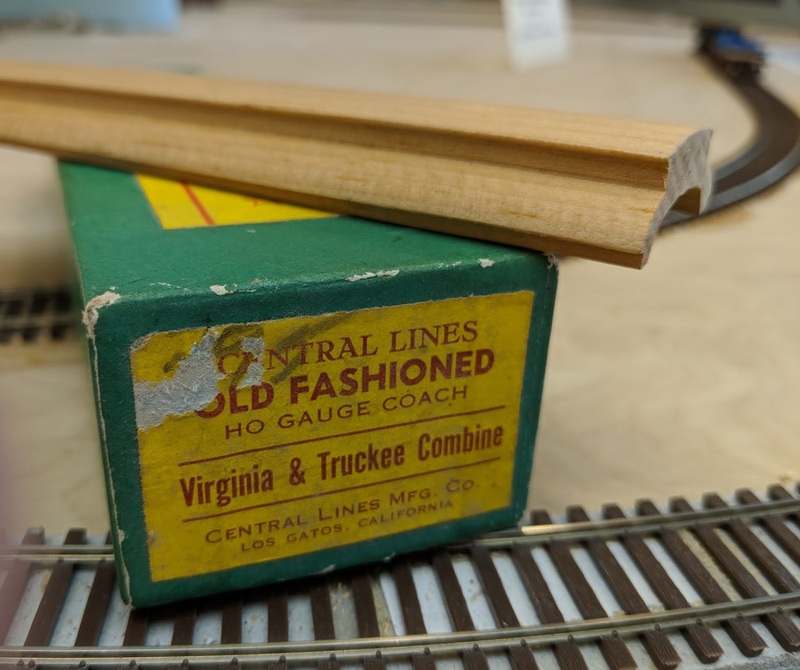 A note that a member of the EarlyRail io-group list wanted to sell an old Central Lines kit prompted the replacement. The Central Lines kits were made in the 1950s, perhaps into the '60s and were crude compared to today's standards. For example, the roof was a milled piece of wood which you were expected to shape into something resembling a clerestory roof. I had noticed a 3D printed roof offered by Eight-Wheeler Models and thought it might be a good substitute. printed roof looks a lot better. The point of the kit is that it had very good sides apparently molded in plastic with decent detail. The roof was designed to fit on Model Die Casting Overland passenger cars but I figured that it could be shortened. The trucks were another item listed on Shapeways which I had used on my Long Caboose project a while back. I started putting the kit together per the instructions. The platform steps were all right but the end railings leaved something to be desired so I substituted Cal-Scale railings. Truss rods are of .015 inch fishing line. Before I ordered the roof, I checked the width of the MDC cars and they were the same as the Central Lines Kit. Shortening the roof consisted of cutting a piece out of its center and gluing it back with some reinforcement on the underside. Some Testors patching putty was used to smooth out the joints. It did not come with the clerestory windows so I cut those out of some stiff cardboard and glued them in.Since the original kit roof was straight with straight letterboard extensions, I glued a piece of styrene to the sides and shaped the ends to fit the new roof. Roof detail is from Grandt Line parts. The lettering was based on the prototype V&T 16 in the California State Railroad Museum. I tried something a bit different for the roof finish this time. In the nineteenth century, the roofing on most passenger cars consisted of sheets of terne metal crimped together. To simulate this, I applied a decal which had lines simulating the standing seams of the prototype. The artwork was borrowed from my friend, John Ott, who developed it for one of his cars. I think it looks pretty nice. Thanks, John.